In mid-September, just a few days before the autumnal equinox, the days are getting noticeably shorter and the sunlight is transitioning from blazing to soft. This is perhaps the best time to eat fresh, ripe tomatoes—you know they’re fleeting, they’ll be gone from gardens and farm stands in about a month, and there’s a sort of desperation about eating them while they’re still around. Mario Batali calls this scorpacciata—a lovely Italian word that conveys this desperate obsession with eating as much of a seasonal food as you possibly can, but only in season (i.e., no supermarket tomatoes in February!). Meantime, I’m using fresh tomatoes in as many ways as I possibly can. Like in this simple, summery appetizer. In a small bowl, mix together goat cheese and cream; add salt and pepper to taste. 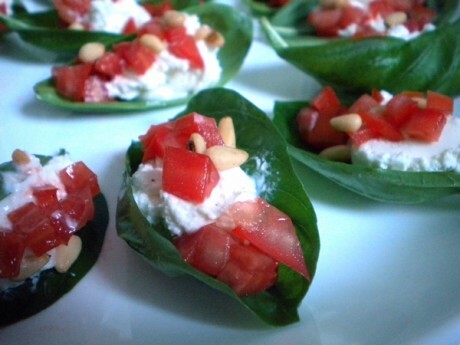 Using two small spoons, scoop a bit of goat cheese in the curve of each basil leaf. Top with finely diced tomato and pine nuts. Just before serving, drizzle each with a bit of good olive oil and sprinkle with cracked pepper. What a wonderful, simple way to enjoy tomatoes and basil while they’re still fresh. I may make this for a dinner party on Saturday evening. Thanks!